(MENAFN - Jordan Times) AMMAN — The Lower House's Public Services and Transport Committee on Tuesday reached an agreement with the ministers of interior, transport and ICT to 'shut down' all unlicensed companies that transport passengers via applications, and in accordance with the 'yellow taxi' owners. The decision was made during an emergency meeting, chaired by MP Khaled Abu Hassan, head of the committee, along with Interior Minister Samir Mubaidin and Transport Minister Anmar Khasawneh, as well as representatives for the 'yellow taxis'. Abu Hassan said that he had met with Mubaidin in his office to discuss legal action against the unlicensed smart application companies, adding that 'Mubaidin promised to issue a communiqué to shut down applications, close unlicensed companies and take legal action against their owners'. For his part, Khasawneh pledged to issue a communiqué to the Public Security Department's Central Traffic Department, under which a fine will be issued for any car that does not comply with the instructions. On permanently blocking the applications, Abu Hassan said that he received a phone call from ICT Minster Muthana Gharaibeh, 'in which he pledged to block unlicensed applications', pointing out that 'unlicensed applications had previously been blocked, but the companies that transport passengers with the aid of smart applications were circumventing [the blocking] by using other methods'. 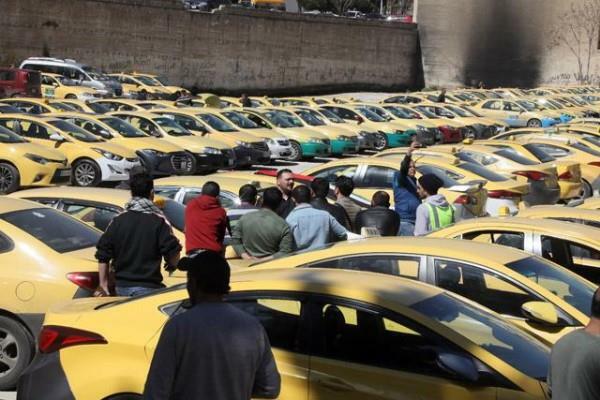 Also on Tuesday, the 'yellow taxi' owners orchestrated a sit-in in front of the Lower House to protest against unlicensed smart applications, the Jordan News Agency, Petra, reported.